In AtoM, there are several kinds of CSV exports available - command-line export of archival description records; export of advanced search results; and an export of jobs completed. Each will be outlined below. The CSV export task is a command-line task that will allow a system administrator with access to the root AtoM directory to export some or all archival descriptions held in AtoM in CSV format. This template is the same as that used for CSV import (AtoM 2.3 and higher), and the export produced can therefore also be used to import data into another AtoM instance. If you specify just a path to a directory, AtoM will generate a name for the CSV. If you wish to name your CSV file, then you can specify the target filename in the path (e.g. in the above example, “example.csv” is the target filename). By typing php symfony help csv:export into the command-line from your root directory, without specifying an export location of the CSV, you will able able to see the CSV import options available (pictured above). A brief explanation of each is included below. The --items-until-update option can be used for a simple visual representation of progress in the command-line. Enter a whole integer, to represent the number of rows should be imported from the CSV before the command-line prints a period (e.g. `` . `` ) in the console, as a sort of crude progress bar. For example, entering --items-until-update=5 would mean that the import progresses, another period will be printed every 5 rows. This is a simple way to allow the command-line to provide a visual output of progress. The --criteria option can be added if you would like to use raw SQL to target specific descriptions. If you wanted to export all published descriptions instead, you could simply change the value of the status_id in the query from 159 (draft) to 160 (published). You could add additional archival descriptions of any level of description into the query by adding a comma then another title in quotes within the ()s.
The --current-level-only option can be used to prevent AtoM from exporting any children associated with the target descriptions. If you are exporting fonds, then only the fonds-level description would be exported, and no lower-level records such as series, sub-series, files, etc. This might be useful for bulk exports when the intent is to submit the exported descriptions to a union catalogue or regional portal that only accepts collection/fonds-level descriptions. If a lower-level description (e.g. a series, file, or item) is the target of the export, its parents will not be exported either. The --single-slug option can be used to to target a single archival unit (e.g. fonds, collection, etc) for export, if you know the slug of the target description. The --public option is useful for excluding draft records from an export. Normally, all records in a hierarchical tree will be exported regardless of publication status. When using the --public option, only records with a publication status of “Published” will be exported. If you are planning on re-importing your CSV export into another AtoM instance, and you are using the --public option, you will need to ensure that there are no published records that are children of draft parents. If so, your re-import may fail! AtoM uses the legacyID and parentID columns to manage hierarchical relationships - but if the parent record is draft (and therefore excluded from the export), then the parentID value for the published (and exported) child record will point to a legacyID that is not included in the export. We recommend you either remove such rows before trying to re-import, or publish the parent record prior to exporting. For more information on the legacyID and parentID columns, and how AtoM manages hierarchical data via CSV import, see: Legacy ID mapping: dealing with hierarchical data in a CSV and LegacyID and parentID. The --standard option allows you to determine if the Canadian RAD template or the international ISAD(G) template is used when exporting. The default if the option is not specified is ISAD(G). AtoM maintains several different standards-based templates (see: Descriptive standards) and there are currently 2 different CSV import/export templates - the default ISAD(G) template, and the Canadian RAD template (because there are many different fields in the RAD template). Other standards-template users (such as DACS users) are encouraged to use the ISAD template. The --rows-per-file option can be used when performing large exports, to break the export into multiple CSV files. You can specify a whole integer representing the number of rows to be included in a single CSV file, before the export task will begin a new CSV. When invoking the task, remember to specify the destination target to a directory, not a filename. In the above example, when 1000 rows are added to the first CSV, AtoM will export it, and begin a second CSV - and so on. Any authenticated (i.e. 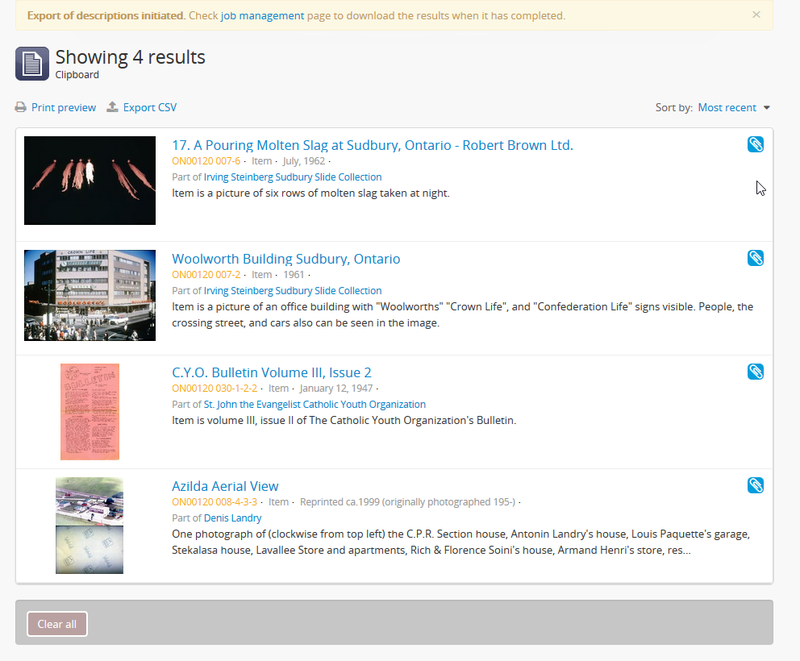 logged in) user can generate a CSV export of Search or Browse results. The CSV export, after it is generated, is made available for download from the jobs page. When downloaded, the file will be compressed in a ZIP archive - there are many free utilities (likely there is one already included on your computer) that will allow you to “unzip” a ZIP file. 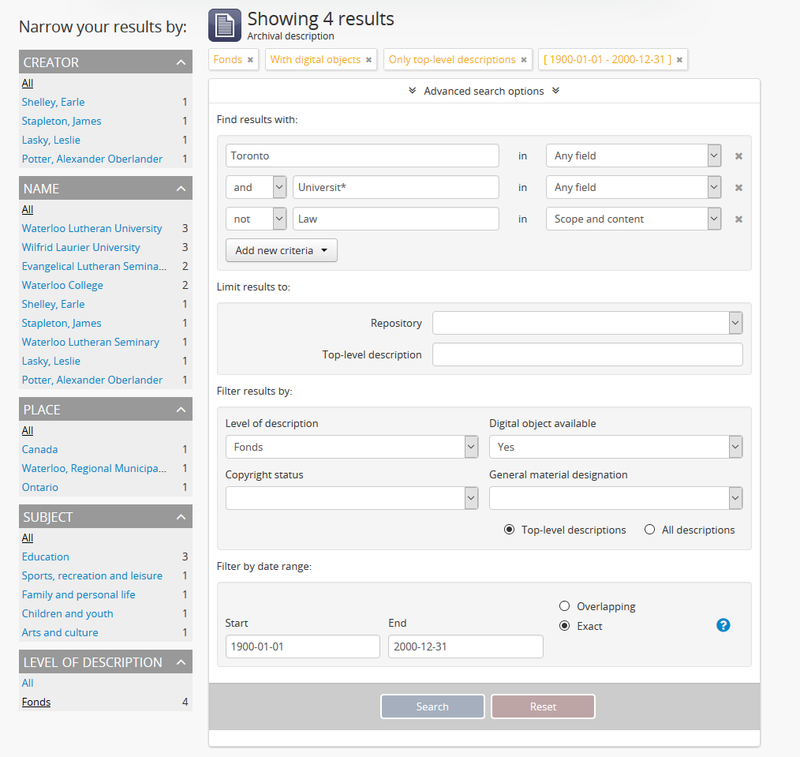 If you wish to limit the results returned based on a search query before exporting, perform a search using the advanced search panel, and/or limit the results using the facet filters available in the left column. 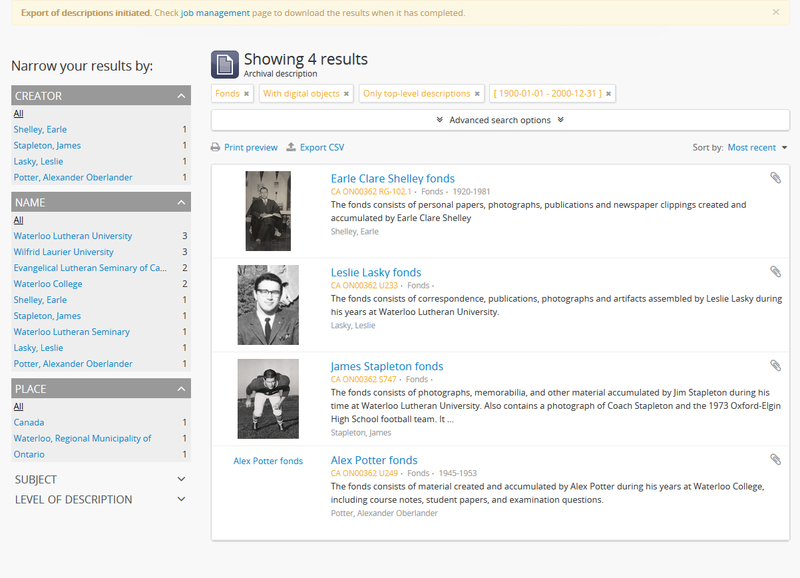 For more information on working with the fields and filters available on the advanced search panel, see: The Advanced search panel. For information on using the facets, see: Facet filters; particularly, Using facet filters in AtoM:. When you want to export the search results returned, click on the “Export CSV” link - it’s located below the advanced search panel, but above the results, on the left. Public users will not be able to see this export link. Currently, the search CSV export feature is only available to authenticated (i.e. logged in) users. The CSV export of the search results will be generated by the job scheduler. After clicking the “Export CSV” link, AtoM will reload the page - scroll back up to the top to see a notification about the job, with a link to the jobs page where you can see the status of your job and download the CSV when it is ready. Click on the link in the notification to go to the jobs page. On the jobs page, you will find information about the export job, including a download link when the task is done. Check the “Job status” column - if it says “Completed,” then the job has successfully finished and you can now download your CSV. It is says “Running,” then the task is still being executed - try refreshing the page in a moment for an updated status. If the Job status column says “Error,” then the CSV export has failed for some reason - talk to your system administrator for assistance. See the Manage jobs page for more information. When the job is complete, click on the Download link in the “Info” column, and the CSV, compressed in a ZIP file, will be downloaded to your computer. 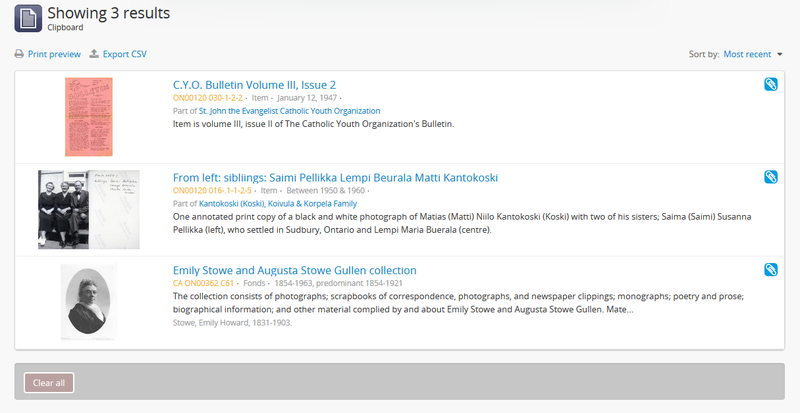 AtoM includes a Clipboard that allows users to “pin” archival description results to it for review or further action. Any authenticated (i.e. logged in) user can generate a CSV export of Clipboard results. 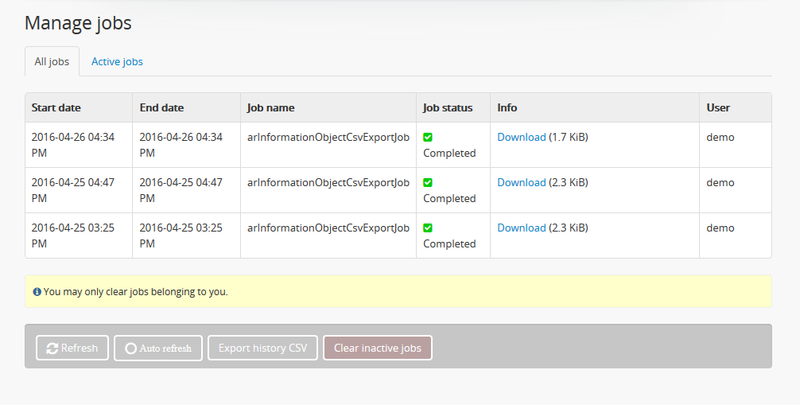 The CSV export, after it is generated, is made available for download from the jobs page. AtoM will redirect you to the Clipboard page. Above the Clipboard results, click on the “Export CSV” link at the top left of the page. Public users will not be able to see this export link. Currently, Clipboard CSV export feature is only available to authenticated (i.e. logged in) users. The CSV export of the clipboard results will be generated by the job scheduler. After clicking the “Export CSV” link, AtoM will reload the page with a notification about the job at the top, which includes a link to the Jobs page where you can see the status of your job and download the CSV when it is ready. Click on the link in the notification to go to the jobs page. AtoM includes a job scheduler in order to execute certain long-running tasks asynchronously to guarantee that web requests are handled promptly and work loads can be distributed across multiple machines. This ensures time and/or resource-intensive tasks do not timeout when running via the web browser. For more information see, Manage jobs. In case users would like to clear completed jobs but keep a record outside of AtoM of previous jobs performed, a CSV export of the Jobs table is available. Like the display table in the user interface, the output contains columns for startDate, endDate, jobName, jobStatus, jobInfo, and jobUser. Simply navigate to the jobs page via Manage > Jobs, and then click the “Export history CSV” button located in the button block on the page. All jobs currently listed on the Jobs page will be included in the export. Only an administrator can see all jobs initiated by all users in the system. Other users can only see jobs that they themselves have initiated - and will only be able to export a CSV of their own jobs. See the Manage jobs page for more information on using the Jobs page.